We have been thrilled when we happened to witness Black Swallowtail and Monarch butterflies laying eggs in the Pollinator Garden. For the Black Swallowtails we have a variety of host plants (plants that those specific caterpillars are adapted to eat) which are plants in the carrot family such as parsley, dill and fennel. 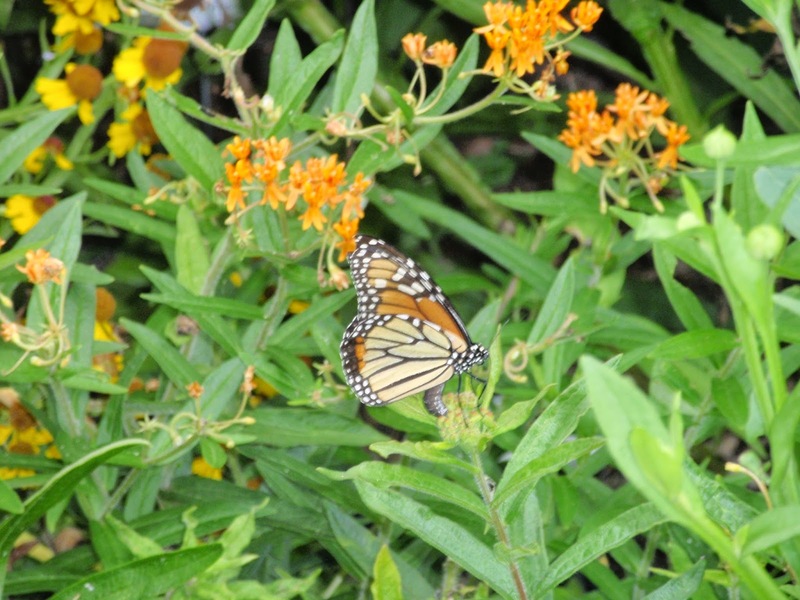 For the Monarchs we have several species of Asclepias (milkweed), the only host plant family for this butterfly. 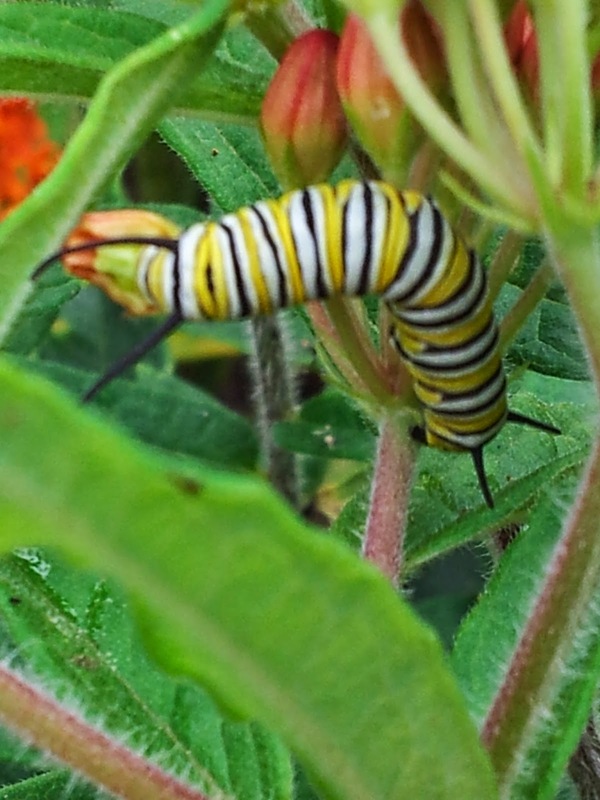 Here is a female Monarch butterfly laying an egg on our Asclepias Tuberosa (Butterfly Weed). You can see her bending the lower end of her body forward to deposit the egg. It is not known exactly how butterflies are able to sense the specific host plants on which they must lay their eggs. 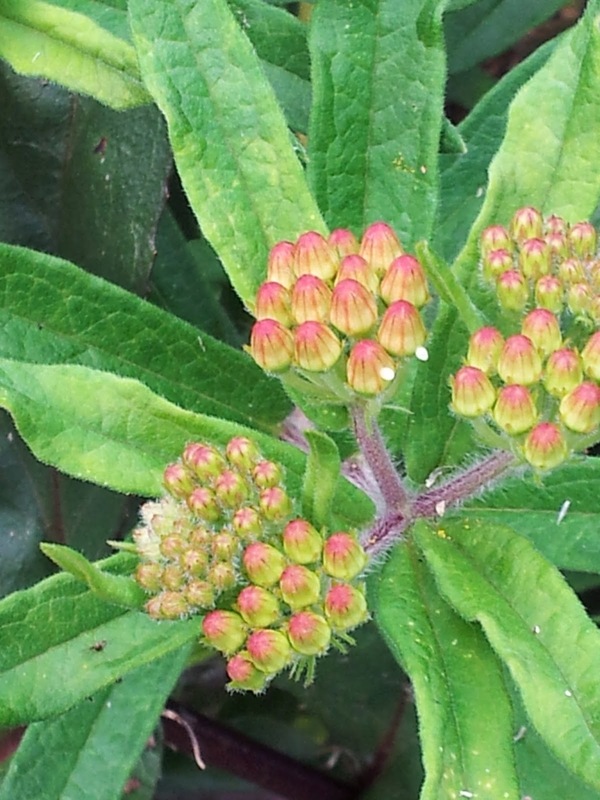 The two white dots on the right side of the center buds below are Monarch butterfly eggs. At maturity this caterpillar will enter a chrysalis stage then later emerge as a Monarch butterfly. Many butterflies overwinter in the chrysalis stage, but Monarchs perform their legendary migration to an overwintering site in Mexico. Given the time of year, if this caterpillar makes it to the butterfly stage (which few do), it could be one that attempts the migration. American agricultural practices have dramatically reduced the amount of milkweed growing in the U.S. In addition, climate change is altering the characteristics of the overwintering site in Mexico, so that fewer butterflies survive the winter. And with the prolonged drought in Texas, it is increasingly difficult for butterflies to find enough nectar flowers to survive this leg of the journey. Gardeners everywhere should consider giving some space to milkweeds. They produce beautiful flowers that attract native bees as well as butterflies.